Who are these sessions for? These classes are designed for those with some watercolor painting experience who wants to make consistent, steady progress with their watercolor painting. Consistent, applied work and practice is the best way to will help push your work to higher and higher levels of skill. In this on-going series of studio classes, you’ll work along-side other watercolor painters and with the guidance of an experienced instructor. 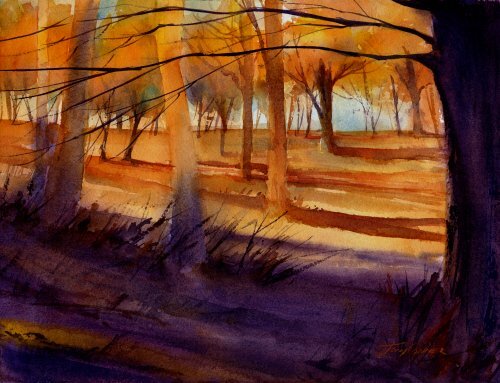 Each class will focus on a particular facet of watercolor painting. Watercolor is a unique and beautiful medium – with it’s own unique working properties and fundamental techniques. We practice those fundamentals regularly while covering more advanced topics in color, design and composition. Over this series of studio sessions, we’ll learn and practice the techniques and skills that will enable you to master the watercolor medium. Location and Directions. Class meets in the Gallery Barn at Taraden. The address is 183 Park Street, North Bennington, VT 05257. If you use GPS, make sure it is set to North Bennington VT 05257. The Town of Bennington, to the south, also has a Park Street as well. GPS software often wants to default to that. If if does, you will get very lost! Once you are at Taraden, enter the driveway through the stone gates. Almost immediately through the gate take a left and follow the driveway down toward the main house, then turn right and head back toward the barns. The Park in the gravel area in front of the middle barn. The Gallery Barn is the large barn to the far left. Enter through the green door at the corner nearest the parking lot. Go through the paper making studio to the stairway at the back. Up the stairs and through the door. Turn left into the studio space. Single Session Cost is $30 per session. To purchase 4 prepaid – click “Add To Cart” button, below, then click “View Cart”. Check out is quick and easy! Thank you!